A lone intruder coming to the new herd turns out to be Brackentail, the colt who betrayed Star and his old Sun Herd in the first novel. Instead of being welcomed by Star’s enemies, he has been banished because nobody trusts a traitor. Brackentail pleads that he believed Star would bring doom to everyone, and begs to join the new herd. None of the River Herd pegasi trust him, but Star is willing to accept that Brackentail might have been honestly mistaken, and that he should be given a second chance. That is barely resolved when devastating news arrives. A new, particularly deadly plague has stricken one of the other herds, Snow Herd, and River Herd has just accepted several refugees from Snow Herd. Sweetroot, their medicine mare, determines that the refugees were Blue Tongue Plague carriers, and that River Herd should isolate itself. Star, conflicted, agrees that River Herd should migrate to the uninhabited northern Ice Lands for the good of all the pegasi of Anok. While Star leads River Herd away from the other five Herds, they begin to jockey for power among themselves; while also, paranoid, each preparing to defend itself from the attack by Star that they fear the “evil black stallion” will surely unleash. 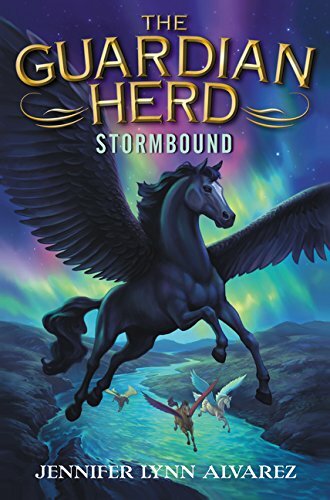 Snow Herd raids Mountain Herd to repopulate itself, while Rockwing, the veteran over-stallion of Mountain Herd, plots to seize Sun Herd’s lands and to kidnap Morningleaf of River Herd, Star’s best friend, to control him. Each time that Star uses his new powers to protect a member of River Herd, they grow more frightening and uncontrollable. Star fears that he is still turning into the legendary monster that will destroy everyone, like Nightwing, the last black foal of four hundred years ago! Even his friends worry that they cannot trust his good nature any longer. Well … why not? If he has the power, why not use it? Or will that lead to megalomania? Or to his herd becoming too complacent, depending on him to solve every problem? Another complication is that Nightwing, the Destroyer from four hundred years ago, is not dead but has been awoken from his ancient sleep by Star’s gaining his power, and is coming from the other side of the world to challenge him; for there cannot be two all-powerful stallions in existence. Star must win his other battles against Rockwing and his grandson, Frostfire, before Darkwing arrives, to be able to concentrate fully upon him. The Guardian Herd: Stormbound is a novel of desperation, betrayals, battles, and unexpected loyalties. Despite the prettiness of the graceful, soaring pegasi – Dewberry is a bay pinto mare with emerald feathers; Morningleaf is a chestnut filly with bright aqua feathers; Rockwing is a spotted silver stallion with dark blue and gray feathers; Twistwing is a red dun stallion with olive-green feathers – they do not hesitate to mutilate and kill each other. And where Starfire ended satisfactorily, Stormbound ends upon a real cliffhanger. Don’t miss the third novel in The Guardian Herd series, out soon – well, eventually.